I first noticed the difference when I swam a fifty-yard freestyle against my 17-year-old son, then again when I sparred a 3-minute round in the boxing ring with my 20-year-old. I was great for the first 25 yards, until the turn, and could hold my own for the first minute and a half in the ring, then something happened. It was not my technique; I’ve been swimming since I was a kid, and I taught both my sons the rudiments of boxing, having been an assistant coach in one of London, England’s oldest boxing clubs. It wasn’t my strength; I’ve still got plenty of that, courtesy of a disciplined regimen of progressive resistance exercise, or even my speed. I can still fast twitch with the best of them. No, it was something deeper and much more fundamental than technique, raw muscle or short bursts of speed. The difference was the boys didn’t slow down; I did. Which leads me to the New England Journal of Medicine: “The primary difference between a 20-year-old body and a 70-year-old body is the body’s ability to use oxygen.” But what exactly does that mean? Let’s go back to the swimming pool. I’m chugging along, arms churning, feet kicking and, from the outside, compared to my 17-year-old son, I appear more muscular (which does not necessarily help in swimming) and my turnover (the speed of my arm movement) is nearly as fast as his. Well … that’s all on the outside. What’s happening beneath the skin is an entirely different matter. And that takes us back to the way my body uses oxygen compared to a much younger body. It is this ability to use oxygen that is a predictor of endurance, and in many ways indicative of the whole aging process. I am not going to get too technical here, but one of the differences between youth and old age — and in many ways the difference between disease and health — is really decided by our body’s ability to bring air into the lungs and how efficiently that air is distributed throughout the cells to create energy. Normally, this declines by about 10 percent every decade as the ability of the heart to pump blood deteriorates, and the capillaries — those places where the blood gives up oxygen and takes in carbon dioxide — become thicker and less accommodating, while the arteries that carry the blood from the heart grow stiff and less flexible, resulting in the whole system straining to supply the body with the oxygen it needs to metabolize food and turn it into energy; the energy that fights illness, restores the body after injury and directly influences our state of mind. And, generally, as we age the breath rises from the belly (the way we breathed as infants) and fills only the upper chest, as we use the mouth, not the nose, as the main organ of respiration. In other words, over time, like any muscle that is not used, the breathing mechanism loses strength and tone as we starve ourselves of oxygen. It all sounds really depressing, but there is something that we can do to minimize this process and ensure that we are maximizing the span of our health, and that is to consciously exercise the breathing mechanism; utilizing the diaphragm, the intercostal muscles that open the rib cage, the abdominal muscles that aid in exhalation when we exercise and the pelvic floor, that band of muscle and ligament that connects the tailbone to the pubic bone and relaxes and contracts with every breath we take. We need to start training this group of muscles as if we were in the gym, building and strengthening our arms or our chests. Breath is at the center of our physical universe. Without it, we are … well … we’re dead. Hold on … Not quite. I’m not going to do that to you, or me … I’ve been working on my own breathing for many years, through martial arts, boxing, yoga, Pilates and have finally developed a method of training the breath based upon the essence of the other disciplines. There’s nothing new under the sun, many of the techniques have existed for thousands of years; all I have done is strip them of their dogma and make them more accessible, combining their essence in simple movements. I’ll go into more detail in future blogs, but for now, let me leave you with one simple thing that you can do to begin correcting bad breathing habits: take a walk, ride a bike, lift a weight, dance the waltz, lie down on your bed, watch TV, but … Don’t open your mouth. Breathe through your nose. Place the palm of your left hand on your belly (not so good when waltzing or biking), feel it expand upon inhalation then deflate as you exhale. That’s your diaphragm working. Be gentle. Do not over breathe. Sip the air as if it is fine champagne. You don’t need to gulp it. Do this for a few minutes every day. Every day. Repetition makes the master. You’re on your way to breathing correctly, like a baby. For the past twenty years, he has given back his knowledge of strength and functional fitness to men and women of all ages, from athletes to doctors. 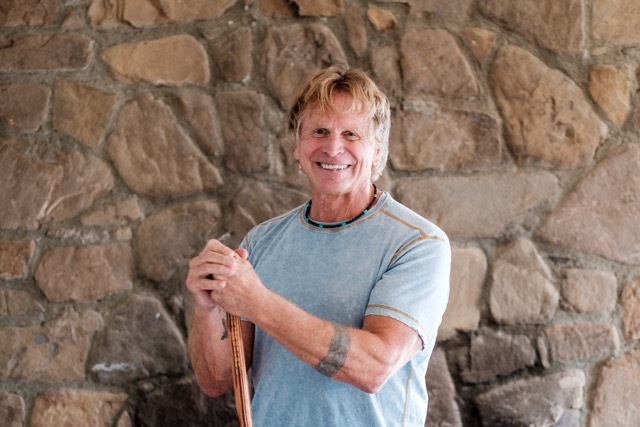 His gym is devoted to the practice of health and wellness, and Real Strength, The Lost Art of Breathing chronicles his eclectic journey back to the basic substance of life, breath. Richard holds a University degree in Psychology, has worked in special education, is a 3rd degree black belt with the Japanese Karate Association, and is a licensed Amateur Boxing coach. He is also a New York Times Acclaimed Author with 11 published books to his name.